It was a running joke amongst friends that our family moved every time I got pregnant. Though it was a daunting task to move babies from Michigan to northern California, to Colorado and back to Michigan in a 3 year period, the experience provided tremendous depth for sharing baby-friendly destinations. When choosing a place to vacation with young children, consider visiting a city. Most large cities offer an abundance of activities for parents traveling with young children. Whether you enjoy zoos, aquariums, fabulous playgrounds, children’s museums or a variety of dining options, the city experience has the makings of a fabulous vacation. Cities also offer professional child-care services, giving parents the chance to re-connect. Check www.vrbo.com to find apartment rentals. You’ll appreciate the kitchen and chance to spread out. Beaches are a natural fit for young children. Sun, sand, water and a bucket are perfect ingredients to make a happy baby. Create a miniature “kiddie pool” by digging a hole in the sand near the water’s edge and letting it fill with water. You may also opt for a Peapod travel shelter so baby can nap in a UV protected shelter while you catch some rays and read a book. 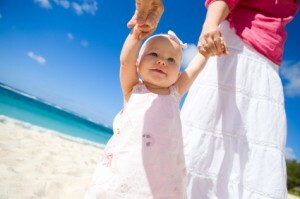 The cruise vacation is well-suited for a young baby. When kids get older, your stateroom becomes all-too-reminiscent of a gym locker (especially if you have an inside cabin). But babies don’t require much space and are therefore great companions for a cruise. Cruise lines offer plenty of kid-friendly activities, pools, food selections for even the pickiest eaters, kids clubs if your children are old enough and child care if they are not. Tip: Earn brownie points for shopping sprees by giving your spouse an opportunity to sleep in. Breakfast buffets and promenade decks are perfect for early risers! Whether you opt for the all-inclusive type (my favorite!) or the a la carte variety, resorts often cater to families with children. Look for resorts with fabulous kids pools, kids clubs and easy access to area activities. I love the website www.ciaobambino.com for its comprehensive list of family-friendly accommodations. If you child is old enough to walk, he is old enough to drift down a beginner’s run on skis with adult supervision. Ski resorts offer free lift tickets to young children and many offer lessons for children as soon as they are potty trained. In addition to skiing, these winter sports communities often offer ice skating, tubing, sleigh rides, hot cocoa & marshmallows around bonfires and lots of other activities to thrill young children. Nothing beats the atmosphere of a small-town festival. Quaint vacation communities across the country offer weekend craft fairs, music festivals, rodeos, kids camps and a full range of family-friendly fun. Lodging in small towns is generally more affordable than big cities. And nearly every part of the country has a neat little town within driving’s distance. Don’t underestimate the value of the weekend get-away in recharging your batteries. Families traveling with young children will prefer using a private rental service like www.vrbo.com rather than charming B&B’s filled with lots of potentially valuable, breakable antiques. Babies like water. Especially when it’s warm and shoots out of the floor or involves some kind of slide. Water parks are cropping up all around the U.S. as hotels and resorts try to provide revenue streams that are not weather dependent. You can also check to see if your vacation destination has a sports arena or community center. Many of these locals’ hangouts have kiddie pools with water features and offer affordable day passes. If you are crossing an ocean, it’s important to know that babies adjust to time zones by burning the candle at both ends. When crossing multiple time zones, it’s important to heed the old parenting adage, “sleep when the baby sleeps”. If your baby eats solid food, jet lag research suggests having high protein breakfasts and lunches and a high carbohydrate dinner to facilitate normal sleep patterns on a new time zone. Though most cultures indulge babies, they are much less tolerant when it comes to noisy toddlers. You and your child will benefit from learning “please” and “thank you” as well as common greetings in the language of the country you are visiting. Dressing children neatly – making sure faces & hands are washed and hair is combed – carries more weight in European countries than it does in the U.S. Be sure to pack an activity kit for dining out. When you children are quiet and well-behaved, they will be welcome almost any place adults are welcomed. Mexico is one of my favorite places to visit with small children. The warm, friendly Mexican people embrace babies – literally in some cases! – and place a high value on family. For stays of 10 days or less, resorts provide the most hassle-free lodging option. If you are embarking on a longer Mexican adventure, explore the idea of renting a private apartment or house with a pool. Domestic help is inexpensive, so consider hiring a housekeeper who will sometimes cook or babysit. (be sure to ask for referrals from the rental company or house owner when hiring domestic help) When you move away from tourist-centered resorts, you have the opportunity to get deeper into the rich culture of Mexico and take full advantage of everything this lovely country has to offer. By introducing travel early, you are exposing your child to concepts of flexibility, self-sufficiency and independence that will benefit him the rest of his life.